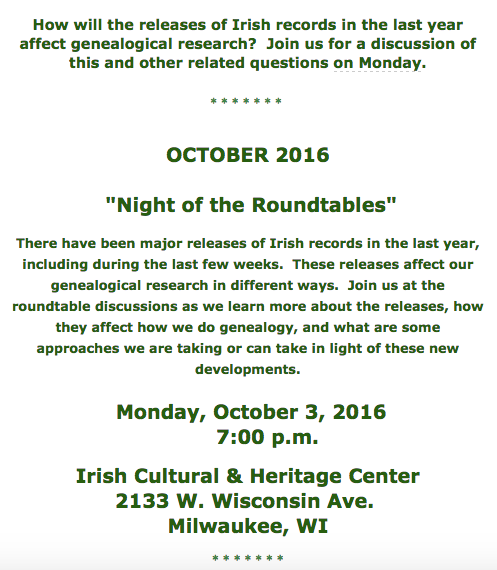 A collaborative table is being planned to discuss what's new in genealogical DNA. and how to use them. production team and an original musical score. 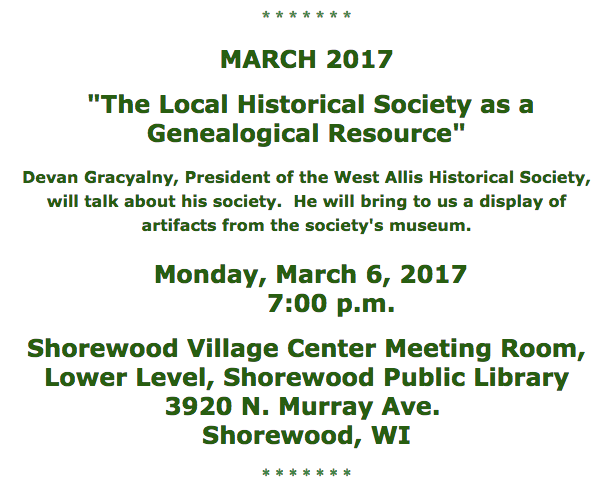 IGSW President Jack Domencich will explore why we do genealogy, what gets us started, what drives us, and what emotions we encounter while doing genealogy. Come and join us in December! 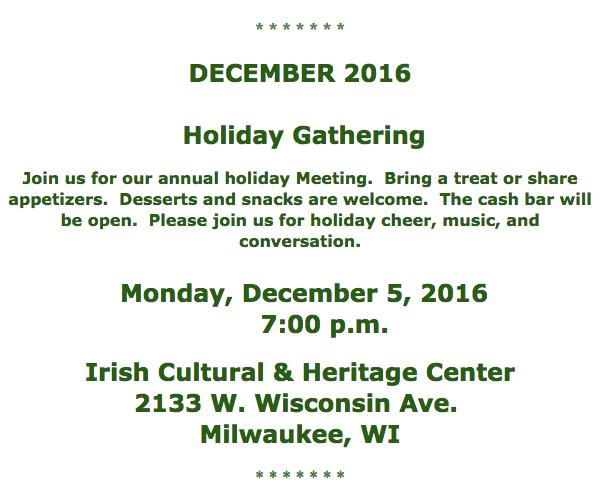 Join us for our annual holiday membership gathering. Bring a treat to share - appetizers, desserts and snacks are all welcome. The ICHC cash bar will be open. We invite you to enjoy the holiday cheer, music and conversation. 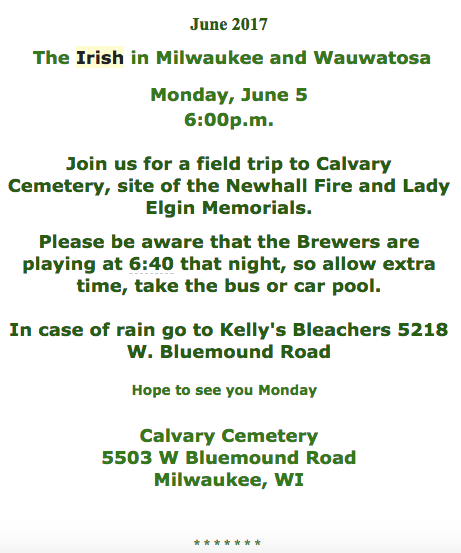 Please join us for “Celtic Spirituality”. 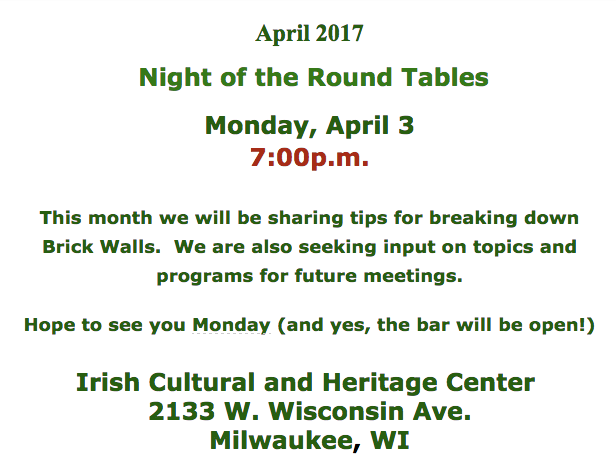 IGSW member Jim Gill will speak to us on the topic of Celtic Spirituality. Jim has ministered as a Parish Catechetical Leader in the Archdiocese of Milwaukee for 36 years and is now Associate Director of Programming at Siena Retreat Center in Racine. He has a Master’s degree in Religious Studies and is a certified Spiritual Director. 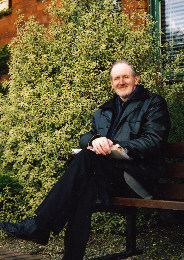 He has had an interest in Celtic Spirituality for 30 years, and in 2001 led a Celtic Spirituality Pilgrimage to Ireland. Come and join us. the East Coast to Nebraska territory. 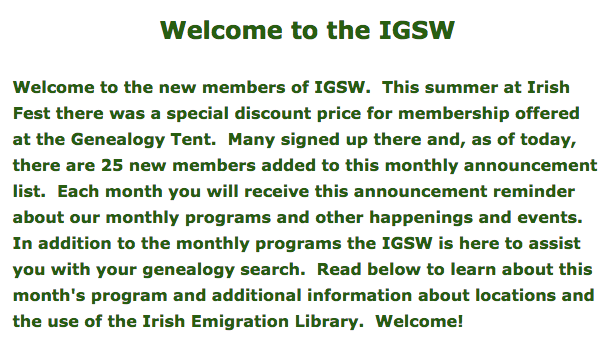 IGSW Programs are free and open to the public. 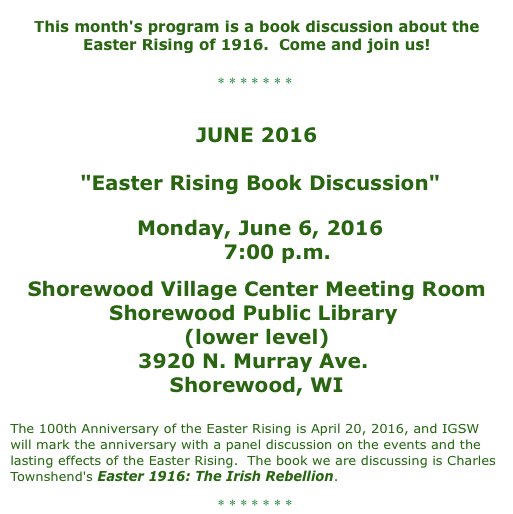 Marguerite Helmers, Rosebush Professor of English at the University of Wisconsin Oshkosh, will speak on the role of women in the Easter Rising. It is estimated that over 100 women served directly in the conflict, using their skills as doctors and nurses, and drawing on their courage to act as dispatch riders and to acquire supplies. 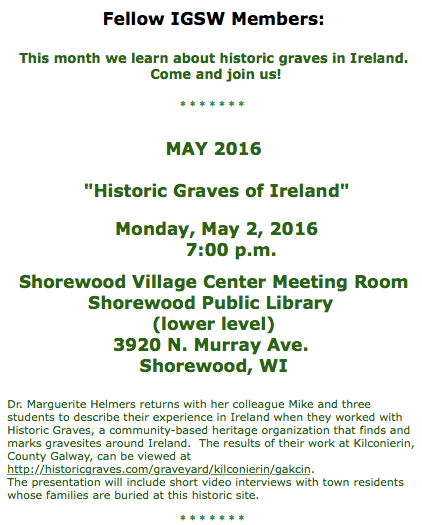 Some, such as Constance Markievicz and Margaret Skinnider, fought alongside the men. 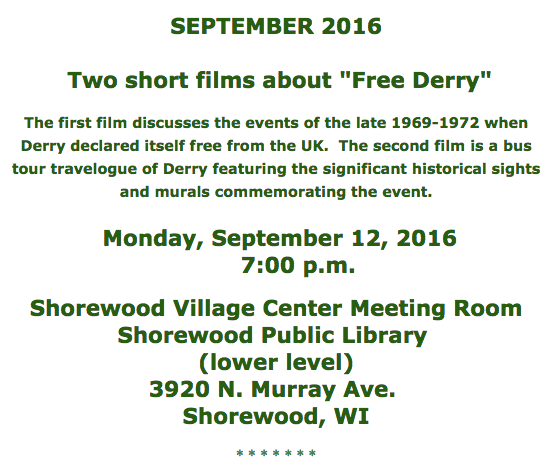 Their stories speak of the desire for equality that the Proclamation of the new Irish Republic offered to its people. 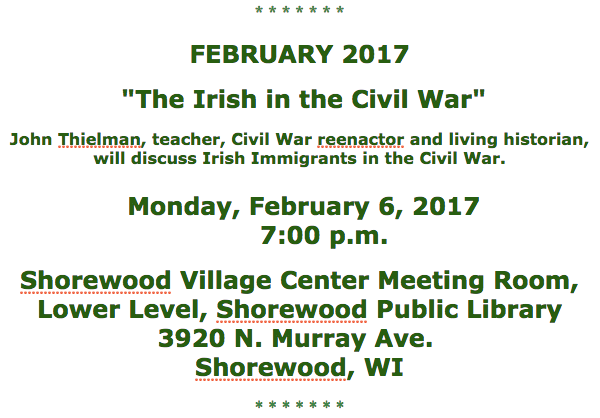 Professor Helmers specializes in word and image relationships, particularly relating to 20th century Ireland and England. Recent publications include several articles on paintings, drawings, and maps from the First World War. Her book Harry Clarke's War: Ireland's Memorial Records, 1914-1918 was published by the Irish Academic Press in Autumn 2015. Following its successful launch event in Dublin last year, Genetic Genealogy Ireland returns for a second year of DNA Lectures at the Back to Our Past event in Dublin, once again kindly sponsored by FamilyTreeDNA and organised by volunteers from ISOGG. 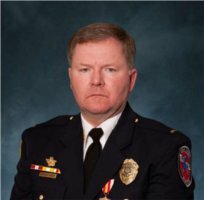 Congratulations to Lt. Brian Murphy of the Oak Creek Police Department and hero of the Sikh Temple Shootings who will be named the Emerald Society's Irishman of the Year. 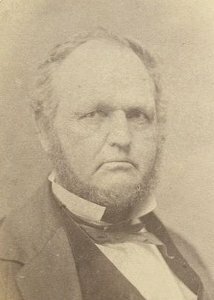 Turtle Bunbury: "For many of us, our main understanding of the American South, slavery and the Civil War derives from countless viewings of 'Gone with the Wind.' New research has revealed that Michelle Obama's forefathers include Charles Shields, a slave-owner of Irish descent, who lived in the very same county in Georgia State where the fictional Scarlet O'Hara's family lived. This is the remarkable story of how Charles Shields and a slave girl called Melvina became ancestors of the first African-American to become First Lady of the United States." Rosie O'Donnell travels from Jersey City to Ireland on an emotional ride to discover her mother's roots. 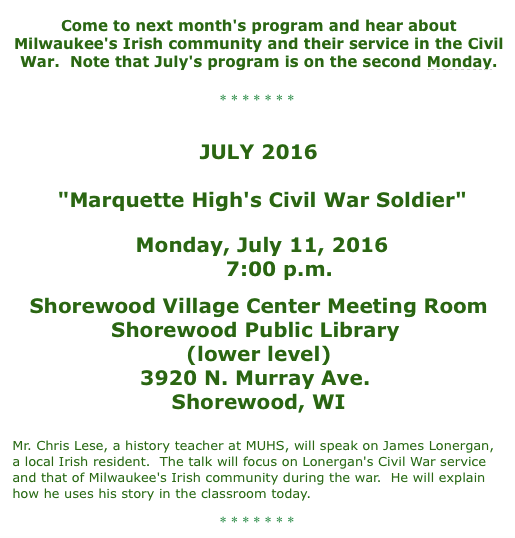 The Irish Cultural and Heritage Center, 2133 W. Wisconsin, is a local and national historic landmark. The center finds itself in a financial situation where the board may have to put the building up for sale. 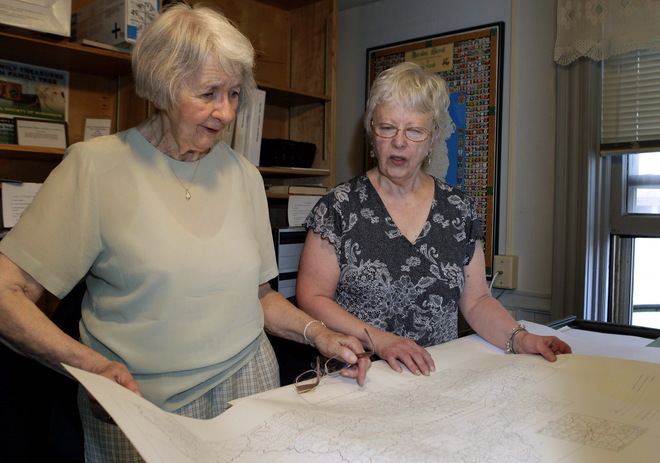 Jane Maher (left), director of the library, and Mary Kay Kuhfittig, a volunteer librarian, study a map of Ireland. 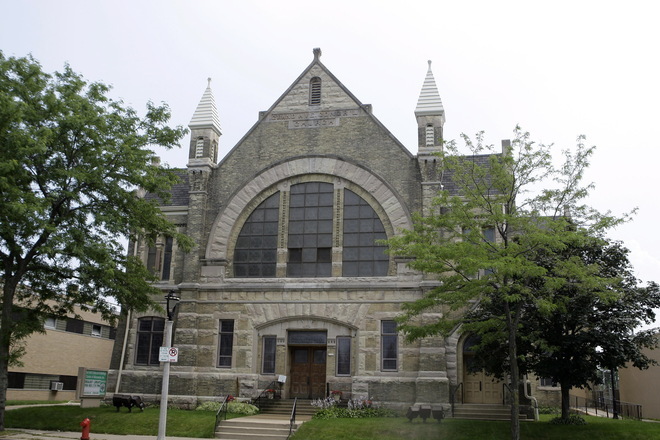 "The very idea to be losing the home for this library is unbelievable," Maher said. 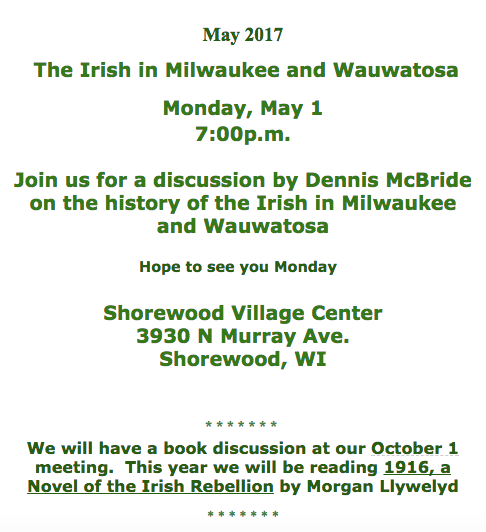 In 2010 Milwaukee Irish Fest celebrated its 30th anniversary. In doing so the festival brought in many great musical friends that have graced the Irish Fest stages through these years. 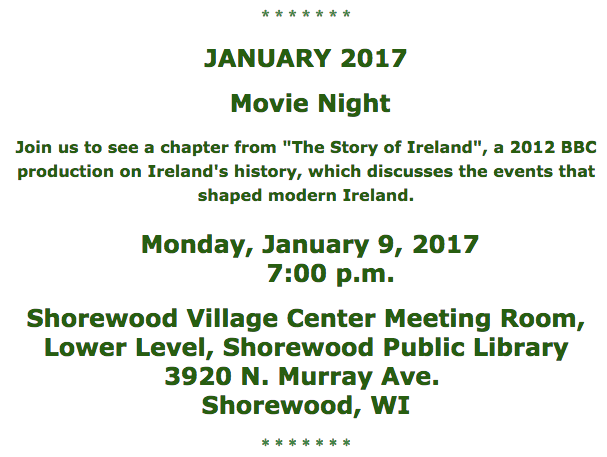 The Ward Irish Music Archives put together a film to document this occasion. Using the iconic song Wild Mountain Thyme as our theme, this film highlights one of the great gatherings of Irish musicians in one moment in time, always the third weekend in August. At our September meeting, Frank Matusinec gave a presentation on how the body of Byron Kilbourn was exhumed in Jacksonville, Florida and returned and buried with his family in Milwaukee back in 1998. We were honored to have John McCabe with us at the genealogy tent for the 2010 Irish Fest. He was born in Enniskillen, County Fermanagh. Before the Plantation (1612) Enniskillen Island was the Headquarters of the Maguire Clan. Today the original Enniskillen Castle complex where the Maguire's resided, incorporates the local Museum. In the early 1960's he established a genealogical research service the basis of which was to assist overseas residents to trace their ancestors in Ulster Province. This Province includes the six Counties which today form Northern Ireland viz - Counties Antrim, Armagh, Derry/Londonderry, Down, Fermanagh and Tyrone. In addition to his work, he enjoys identifying 'hidden' records relating to Irish emigrants, migrants, transportees from Ireland and military personnel. 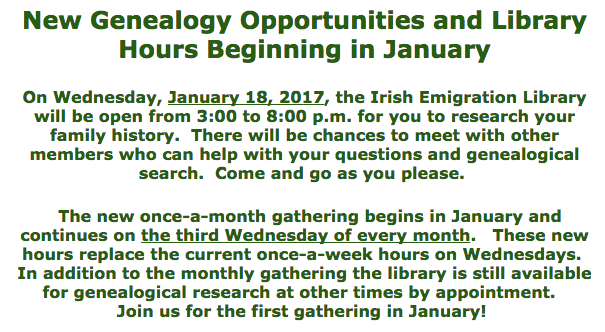 The most successful outcome was the finding of some seven hundred families, mostly Irish, residing in Bytown (Ottawa) in 1829. In 1988 he delivered the Houston Memorial Lecture at Seminar 88 in Ottawa which included photocopies of the above mentioned 1829 list. 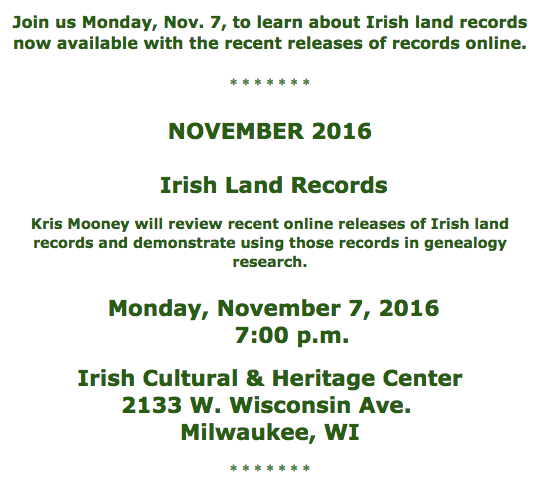 This source was published by the Ontario Genealogical Society as the McCABE LIST - EARLY IRISH IN THE OTTAWA VALLEY. Editor Bruce S. Elliott.